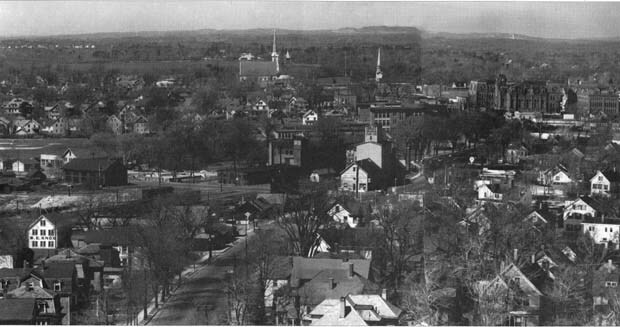 "This panorama of downtown Wakefield was taken from the Harts Hill fire tower in 1949. The steel tower, perched 40' above the summit of Harts Hill was erected in the spring of 1913. Wakefield's ownership of the Harts Hill area, said to be named for Dr. John Hart, occurred in 1901 when the Town of Wakefield voted to take title of the 23 acres, with the stipulation that it be 'forever kept open as a public park and reservation.' The Town also voted to purchase the Flint estate at a cost of $5000 with the Metropolitan Commission offering an additional $5000. Eight 'public-minded' citizens purchased and gave to the Town eight properties and one acre not included in the Town's original purchase. In 1924, Park Commissioners voted to keep the playground at Harts Hill." -- Text from calendar by Jayne M. D'Onofrio. “Panorama of Wakefield, 1949,” NOBLE Digital Heritage, accessed April 22, 2019, https://digitalheritage.noblenet.org/noble/items/show/7045.